We can’t deny that the existing of the world is impossible without wars. Every country should be ready for defense in case of an unexpected attack, that’s why the weaponed army with professional paramilitary forces should be ready to take action. We all dream about peace but the power and money have the strength to influence people’s minds, so they often become the reasons of wars across the globe. Selling the firearms is also a profitable business, and although it is an illegal one, all of us know that guns are often bought not just for self-defense. Here at WP Daddy we are against wars and we want the world to be always peaceful and people to be happy. And it is kind of cool that there is not a big amount of WordPress themes devoted to weapons and military services, but in this collection we’ve hand-picked some of the themes dedicated to paintball and strike-ball clubs, pneumatic guns online stores, security, and protection, as well as other subject-related templates. So check them out and take them for peaceful needs like role-playing games, and more. 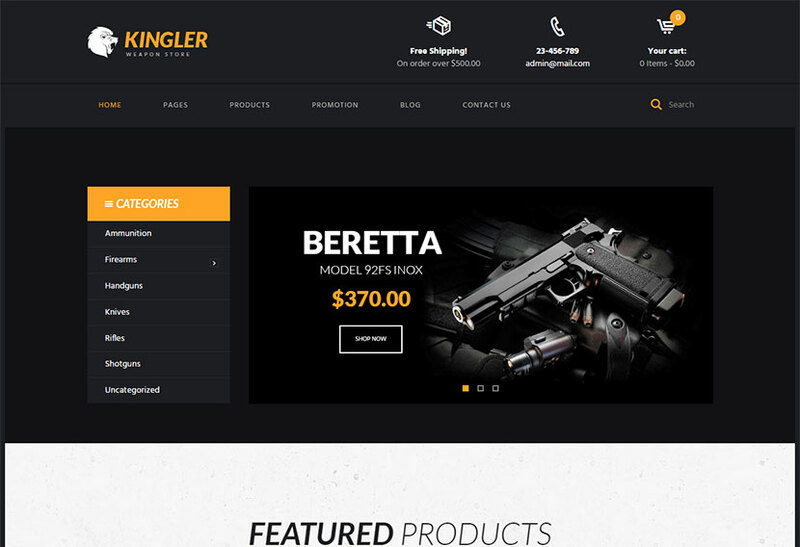 A WordPress theme absolutely suitable for weapon shops, shooting schools, gun classes, shooting ranges or firearm training websites. 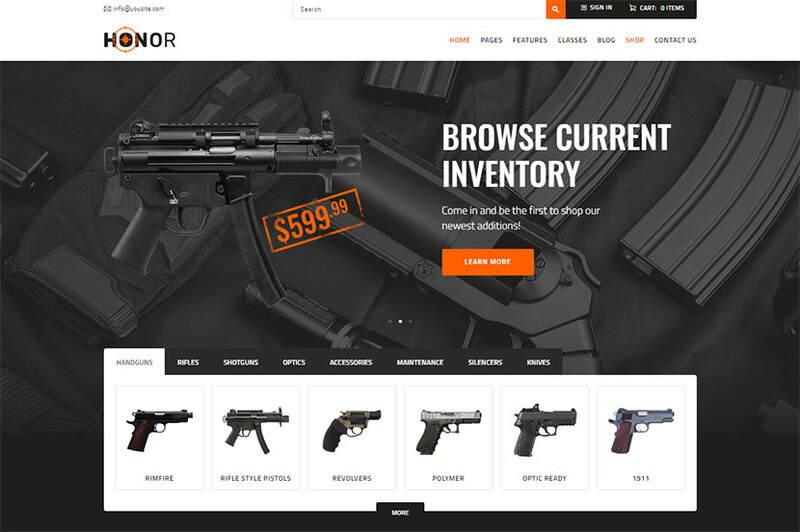 The template is based on WooCommerce which means it comes with complete shop functionality and allows to launch an online store for selling weapons, firearms, hunting and military accessories. Among the theme’s features it’s important to distinguish WPBakery drag-and-drop page builder which allows to build unique layouts, Events Calendar which helps to mark and manage appointments, and more. 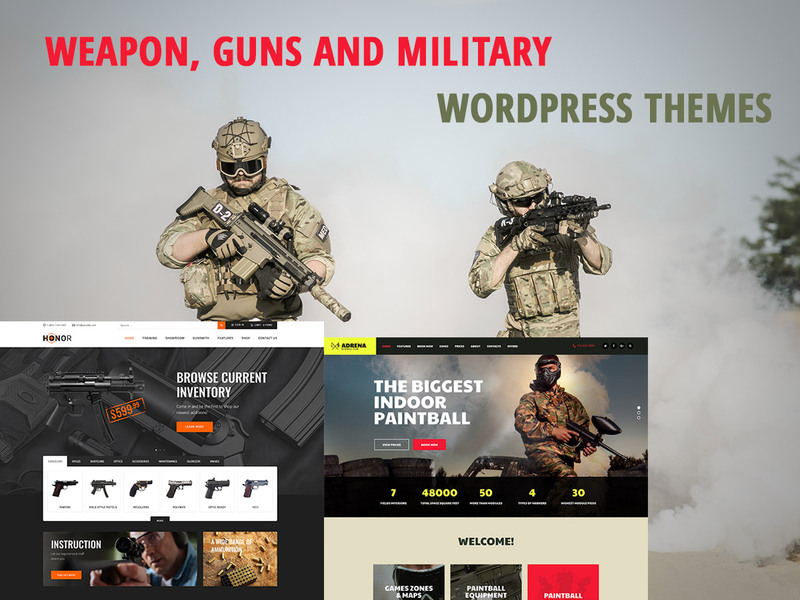 A WordPress WooCommerce theme suitable for military training classes, gun training, shooting club, online military or weapons store, and more related purposes. The theme comes with both Revolution and Swiper Sliders integrated, so you can present your product in an attractive manner on any web-page. 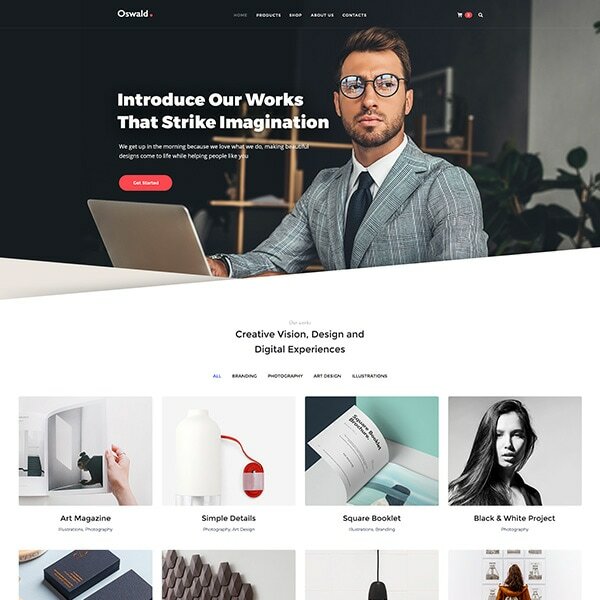 The template is built with valid HTML5 and CSS3 code, comes with Boxed and Wide page layouts, includes WPBakery page builder to create unlimited variants of homepages, comes with different navigation options, as well as more features and plugins. 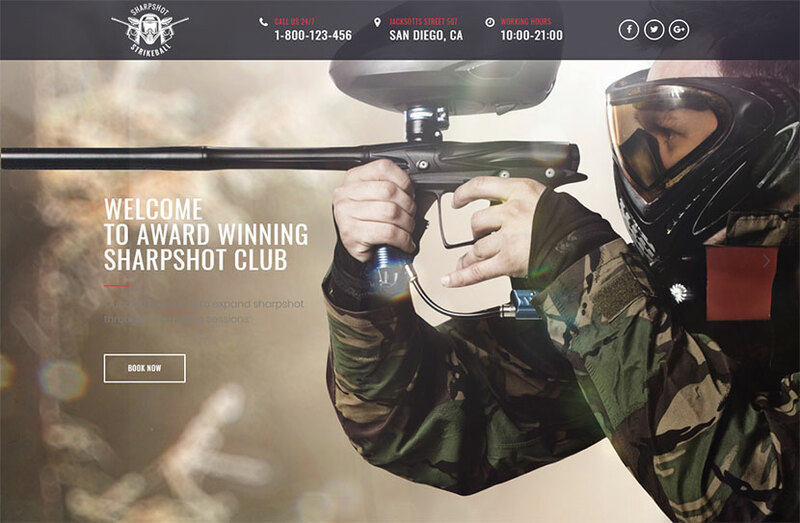 A professionally made WordPress theme created for shooting clubs and shooting training classes. Military training, pneumatic weapons store, or any other related businesses are possible to promote with this theme. It comes with visual page builder, unlimited colors, a built-in SEO extension, unlimited icon fonts, 10+ site preloaders, Google maps, valid HTML5 and CSS3, 3 homepage combinations and the ability to create a unique homepage template with visual page builder, WooCommerce support, 2 blog page versions, more than 9 portfolio page variants, dark, light and boxed layouts, and more features. 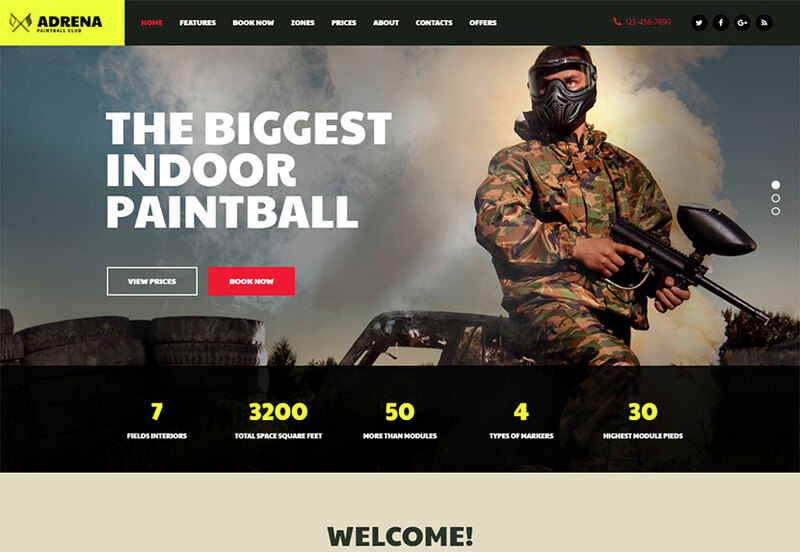 A WordPress theme which will be both suitable for sports clubs and trainers as well as paintball and strikeball players, airsoft, lazertag, hardball and other para-military games. The theme is quite suitable for selling military clothes and equipment, sportswear and gears, paintball player uniform, and more. It comes with Slider Revolution & Swiper Slider included, interactive ajax search, flexible colors & typography, boxed and fullwidth page layouts, 20+ post animations, WPBakery page builder with drag-and-drop interface, and many more features available. 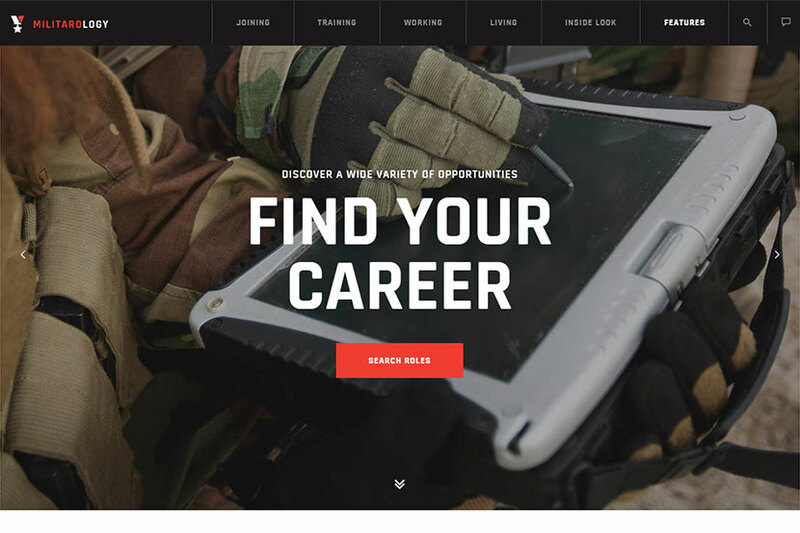 A masculine WordPress theme made for showing the pride of army and military service. The theme will best suit for military school including air force, navy, and more. It also fits for boot camps, military veterans association, military club, and more related purposes. You can use the template for promoting military services, or you can utilize its eCommerce functionality to launch an online store and sell military gear. The theme has got a comprehensive list of features including a great collection of shortcodes and widgets, boxed and fullwidth layouts, advanced blog settings, flexible colors and typography, WPBakery page builder integrated as well as Revolution and Swiper Sliders, interactive ajax search, 20+ post animations, powerful theme framework, and more. A WordPress theme created to show pride and strength of military forces. Veterans association, military club or school, army service promotion website, and other related purposes are also possible. 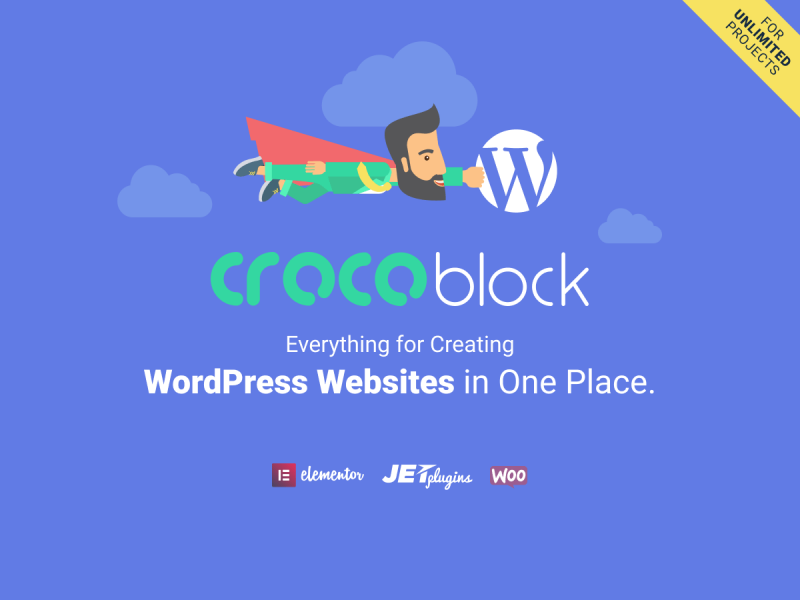 The theme comes integrated and compatible with a bundle of premium plugins like Revolution Slider, PO Composer, Essential Grid, WPBakery page builder, and more. They are meant to help you create your exclusive layouts, build beautiful galleries and showcases as well as present your activities in the most engaging manner. The theme is fully SEO optimized, easy to edit and customize, and comes with much more advantages. A security service company WordPress theme which can be also used for weapon and guns related websites as well as military services projects. The theme is based on Redux framework which gives it a lot of options through the Customizer. 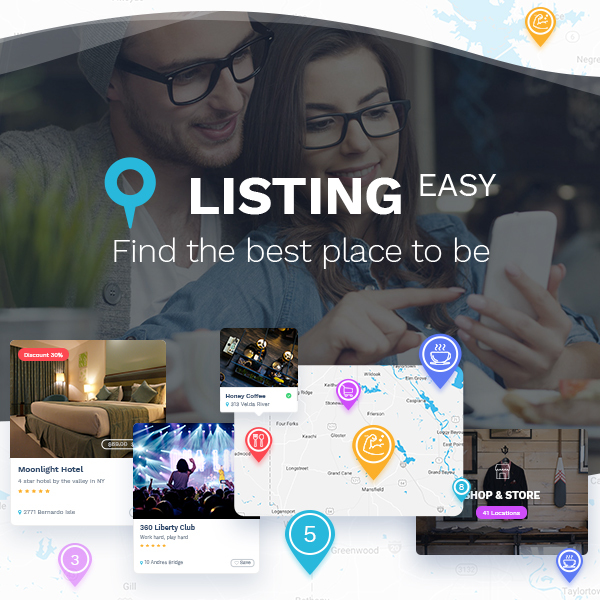 Contact Form 7, 2 types of awesome galleries, animation effects, a bunch of pre-made home and inner pages, WooCommarce compatibility, unlimited colors, easy customization, WPBakery page builder, social integration massive theme options, and many more features are also included.